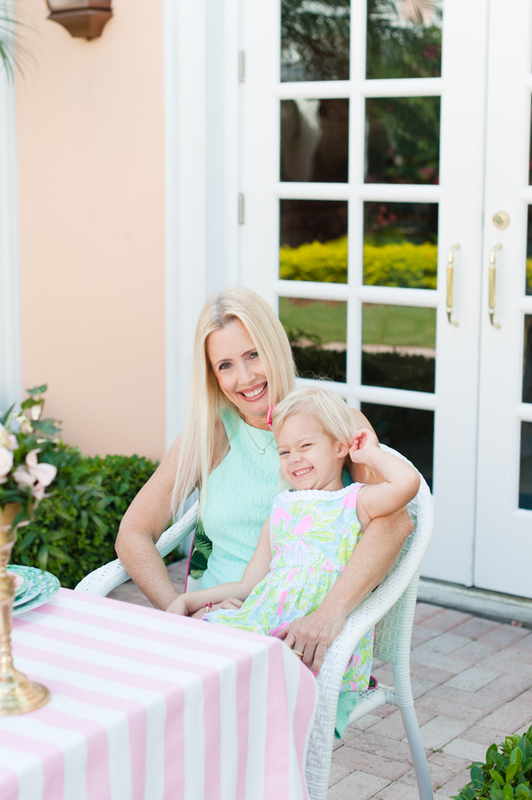 Mother’s Day this year will be a special celebration for both of us! Beth recently became a mommy to a baby girl so this is her first Mother’s Day, and I am excited to soon welcome a baby boy who will make our family a party of five. Beth and I are also very thankful for spending another wonderful year with our mother and grandmother. That’s right, four generations of family are all local and lucky enough to celebrate holidays like this together! 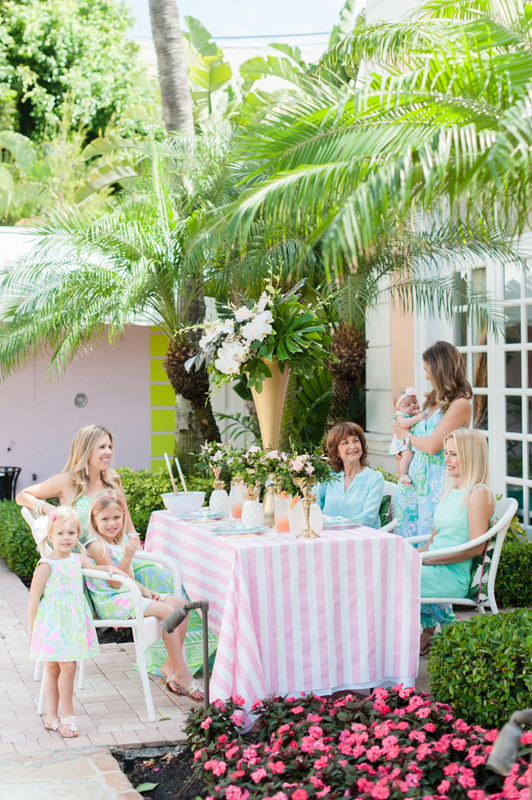 It’s really important to us that we stop and savor these moments, so we decided to throw a Mother’s Day brunch that is oh so Palm Beach thanks to our friends over at Frontgate. We couldn’t wait to use these tabletop pieces from Carleton Varney for Frontgate’s new outdoor living collection. 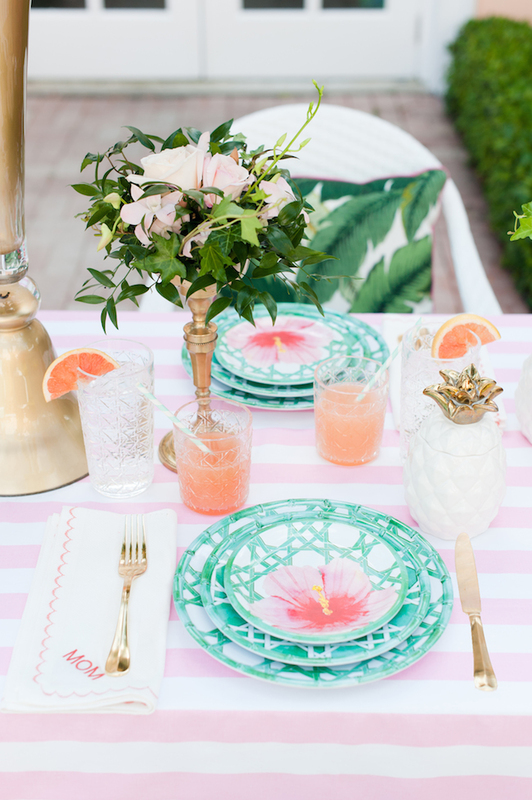 If you haven’t seen all of his stylish jade, pink and mint outdoor pieces, you need to check them out. 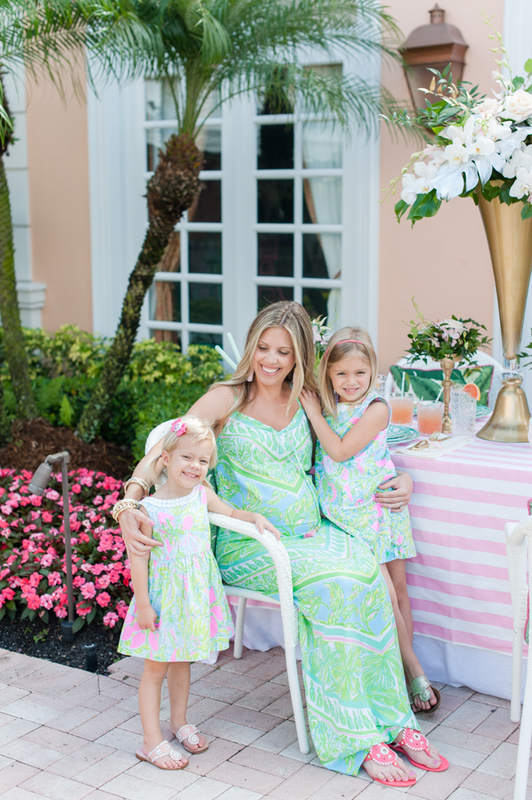 But first, come along for a sneak peek at how we combined a beautifully styled tabelscape at The Colony Hotel with special details like embroidered “MOM” napkins, fashion by Lilly Pulitzer <stay tuned for a full fashion feature later this week!> and a delicious watermelon salad and grapefruit drink. 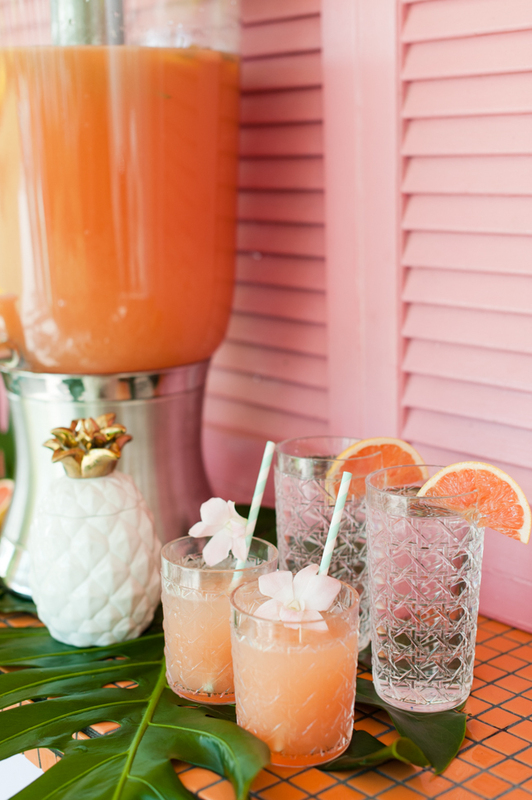 We are girls who live for the details, and we always start by creating a special color palette for every get together we host. 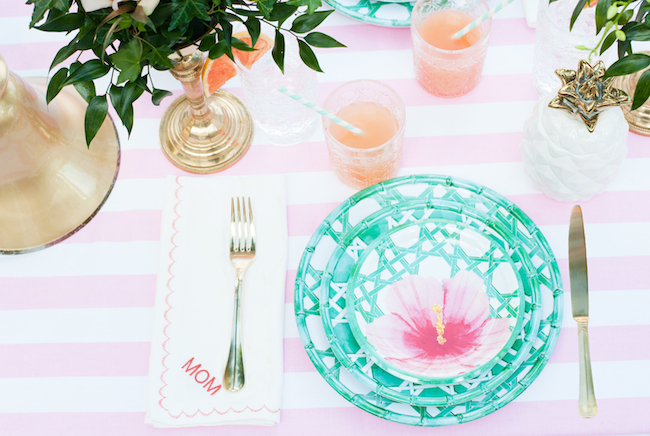 For this brunch, we chose the pale pink, hot pink and jade color palette around the chinoiserie and floral plate pattern. 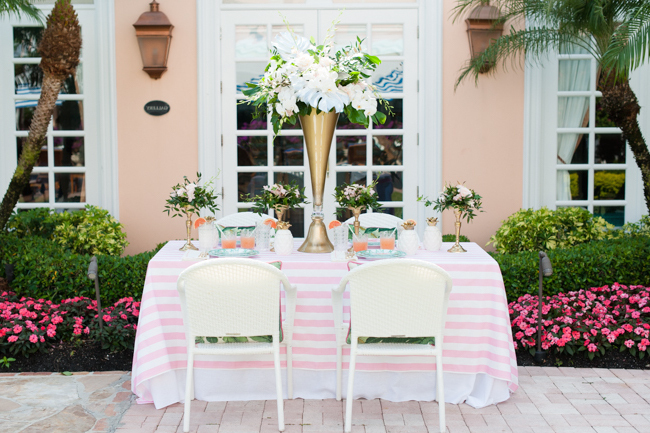 You will also find these classic Palm Beach colors in the striped linen, Palm Beach Lately’s Banana Leaf Pillows, florals, and even the food and beverage! 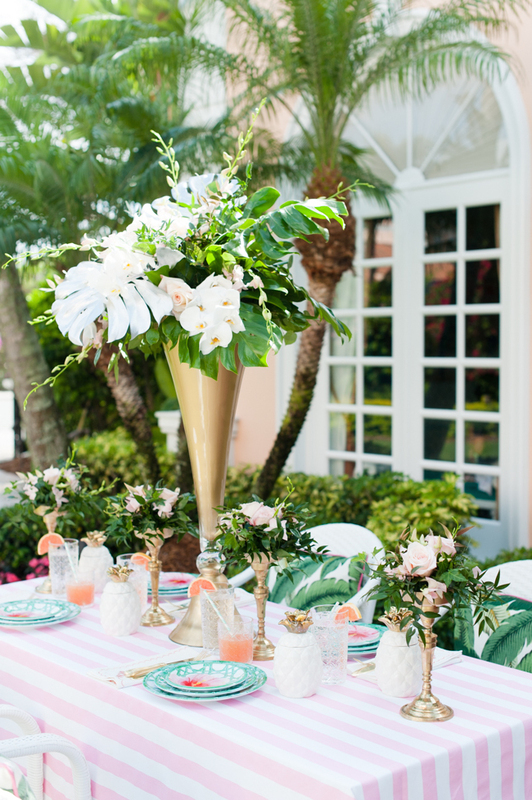 After coordinating a tabletop theme and color palette, we began brainstorming floral and decor ideas. One of our favorite elements on the table is the over-the-top centerpiece created by The Event Group. 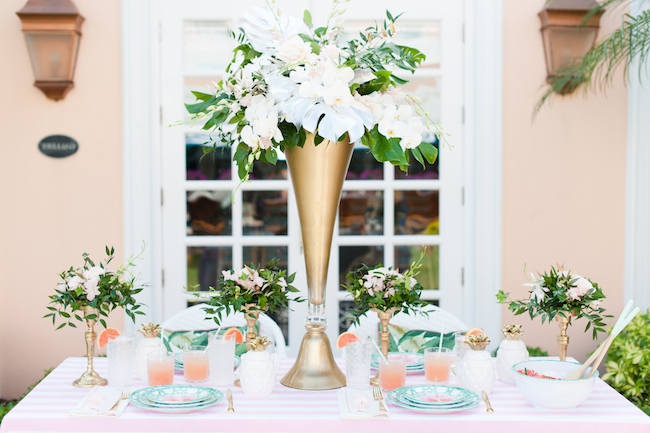 We love how the custom gold hourglass vase and gold pedestals hold a mixture of fresh leaves, orchids and roses that go perfectly with PBL’s Banana Leaf Pillows. We are also swooning over these cute pineapple scented candles that double as decor and great take home gifts! Since we are celebrating Mother’s Day, we wanted our mom and grandma to feel extra special, so we had luxurious scalloped napkins embroidered to say “MOM” and used our fancy gold silverware. 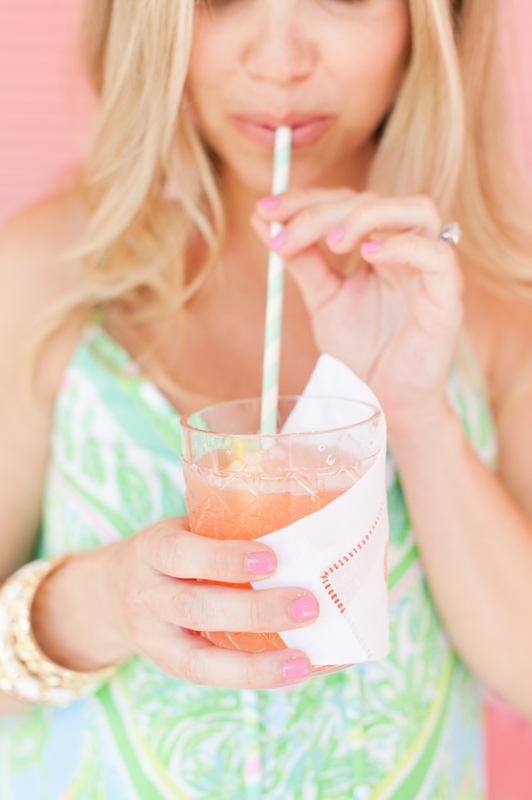 It’s the simple yet thoughtful touches like this that show our guests it’s all about them! 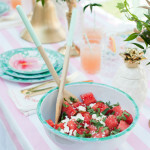 We love fresh, whole foods and decided to serve a watermelon salad as a starter for the brunch. We’ll share the recipe later this week, but wanted to point out how beautiful it looks in the caning serving bowl. 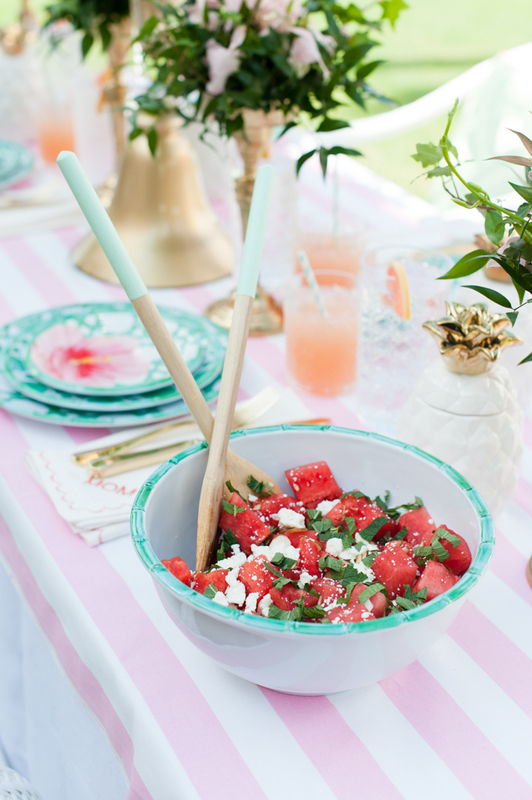 All of the dining pieces we used are shatter-resistant and dishwasher-safe melamine, which is ideal for outdoors and using around small children! 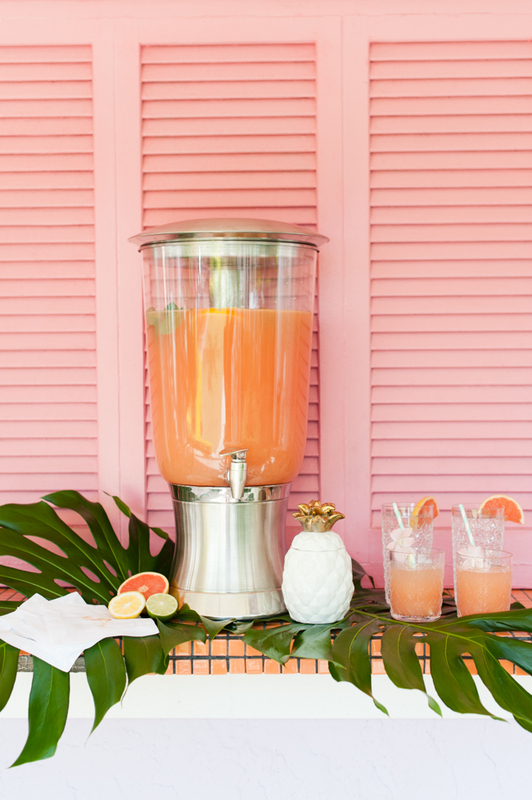 To complete the brunch, we displayed a grapefruit drink in Frontgate’s large drink dispenser and served it in caning double old fashioned glasses with our Palm Beach Lately Icon Cocktail Napkins <come back later this week to find out what we are drinking!>. 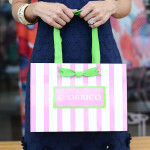 We hope you enjoyed this sneak peek at our upcoming Mother’s Day celebration. We had so much fun putting the brunch together and spending time with our family. 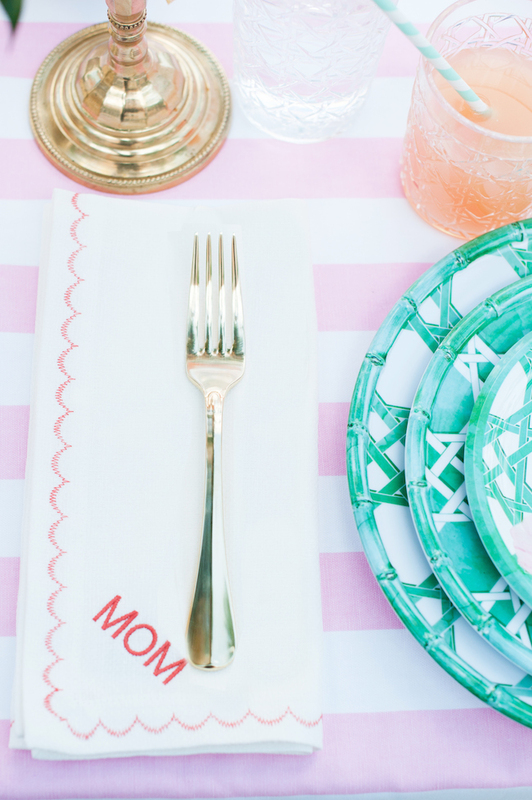 It is our hope that we inspired you to create a special Mother’s Day brunch for you and/or your family, too! 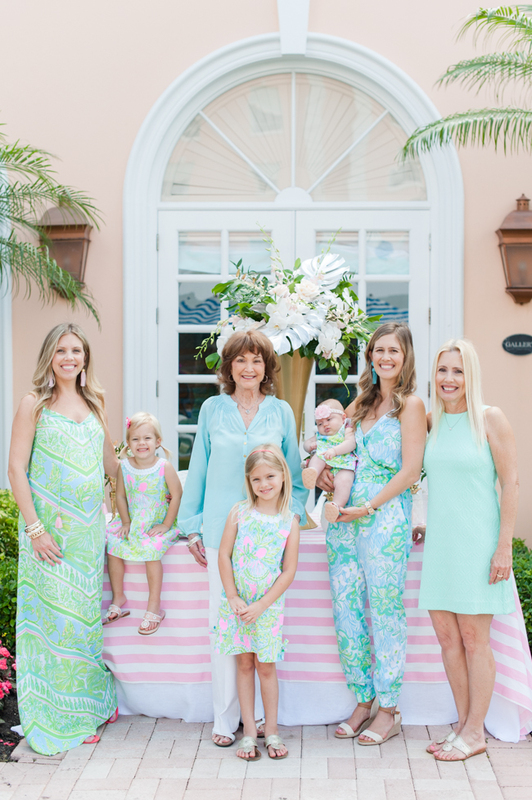 And don’t forget to stop by each day this week for more Mother’s Day fun and style, like a special giveaway and the one style lesson our mom taught us… tomorrow on the blog!